Did you know Baby Gourmet also makes pureed snacks for toddlers and school aged children called Squoosh? Squoosh is a fruit puree made of 100% organic fruits and vegetables and just one 3.2oz pouch counts as a full serving of fruits and vegetables! Squoosh products contain no added sugars or salts, and is gluten-free, GMO-free, nut-free, and comes in BPA-free packaging. I was sent two of the flavours above: OrangoBango and Banango and we put it to the test. I had my children try them (well two of them, the 7 year old refused to try it!) They weren’t fans of it but then I brought it to our PFLC playgroup and the kids went wild! Every kid in the room loved the Banango (the flavour I brought.) Some of the younger ones couldn’t figure out how squeeze it only when it was in their mouth so their parents squirted it into a bowl for them but they still loved the flavour. The testers ranged in age from 10 months to 4 years. My child was the ONLY one that didn’t eat it. The pouches were easy to open and can be recapped and saved in the refrigerator for up to 24 hours if your child doesn’t finish it all. However these kids above from playgroup finished TWO in one sitting. I’m going to bring some of the OrangoBango to playgroup next week to share the yumminess. I tried both of them too and I preferred the OrangoBango. I must say that although each flavour contains a vegetable, they did not taste like vegetables at all. You can only taste fruit. 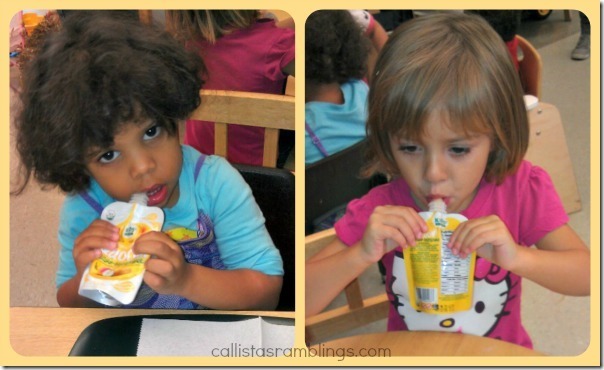 It’s the consistency of applesauce or baby food but tastes much better than just juice would. I don’t like fruit juices, even the ones that are made from real fruits and vegetables. But writing this post is making me want to steal one more. Make sure you put them in the fridge as they taste much better cold! Squoosh would make a healthy and fun stocking stuffer alternative to candy.